Maik Twelsiek takes first place at TriStar111 Minnesota! Second place goes to irish Karl Bordine. Third place to Devon Palmer. Due to bike problems, MACCA was forced to drop out of the TriStar111 Minnesota. He switched bikes and then entered the last wave of the Maple Grove Sprint Triathlon. MACCA said this before he took off for the sprint race, "Races don't always go as planed, but I wanted race for the fans that have been so good to me here in Minnesota." Gu, official gel of TriStar Minnesota! GU Energy Gel is honored to be the official gel of the TriStar111 Minnesota event, and to support all the athletes racing today! GU provides easy to digest nutrition on-the-go, giving your body a quick boost and sustained energy to fuel you to the finish line. Learn more about the entire GU product line at www.GUenergy.com. To keep yourself updated on the triathlon doings at Maple Grove, Minnesota - check out the live photo coverage page, which will be renewed constantly throughout TriStar Minnesota. MACCA, first out of the water at TriStar111 Minnesota! Once out of the transition area, you will go on the 100km (two laps) of cycling on a course offering scenic views of the Maple Grove, Plymouth and Corco- ran landscape. Drafting is not allowed. Recommended gear ratios 11x23 for PROs and 12x25 for Age Group Athletes. This race will be the first Tristar race for 98% of the participants. 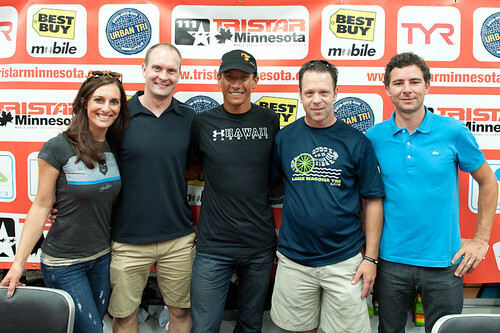 Best Buy Mobile is proud to present LIVE video streaming and GPS pro-athlete tracking during the Maple Grove Triathlon and TriStar111 Minnesota events this Saturday, August 27, 2011. Best Buy is on-site with live video and GPS feeds of the race showcased on four large screens in the Best Buy tents for convenient viewing by friends, family and athletes. You can already stop by the Best Buy Mobile tents to watch the live video feeds or watch the PROs battle it out with live GPS tracking. Friends and family can also install video tracking applications, enter to win prizes and see if they’re eligible for a new phone upgrade. Best Buy is also on site providing a mobile charging station for cell phones and a wifi mobile hotspot to connect mobile devices at the event. The swim will take place in the beatuifull Weaver Lake. This is a single-turn route following the buoys in the lake. No waves. The swim is easy to follow for spectators. There are 100m to T1. TriStar111 Minnesota 2011 is about to start in 10 Minutes. 104 individual athletes will compete in the new Triathlon format focused on fun, environmental protection and social responsibility. 3 male professionals and 1 female professional will be swimming 1km, cycling 100km and running 10km and trying to win today's race. World Champion Chris McCormack (AUS) and Maik Twelsiek (GER) confirmed their participation, so it will be a great duel on Saturday, as both athletes want to grab the win and beat other strong PROs coming from all the US! Local athletes are here to make competition stronger and harder for others! Good Morning for TriStar111 Minnesota! It's Race Day morning in Maple Grove and the waters of the Weaver Lake are still flat and calm. Athletes commence checking in their bikes and transition bags and get ready for the race entailing 1km of swimming, 100km of cycling and 10km of running. We'll post photos, twitter updates (from our spotters) and quick updates throughout the day. Use the LIVE RANKINGS tab in order to get access to the information coming in from the timing. In the LIVE RANKINGS tab, you'll find three links: Current Race Results, Results per Split and Personal Results. Try it out and you'll see it's pretty straightforward. Enjoy the day - Yes, you can! The run circuit consists of two laps on a very fast circuit of 10km. It will take you around Weaver Lake before finishing in the heart of the park before crowds of spectators. Enjoy your last few meters on the Finish Line! Maik Twelsiek, a Tucson, Arizona, USA native, finds himself in his first TriStar111 Race this weekend. As a young kind he found himself involved in football and tennis. It wasn’t until the transition area of the local triathlon was located on his playing field, did he become intrigued with the idea of a triathlon. Twelsiek placed first in the 2009 Ironman in Lake Placid, New York, USA. 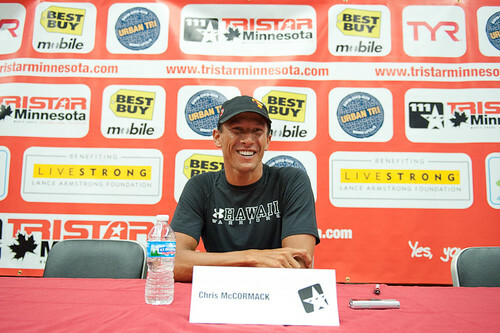 Chris McCormack, also known as Macca, is an Australian triathlete. McCormack is a two-time winner of the Ironman World Championship, winning the titles in 2007 and 2010, as well as the winner of the 1997 International Triathlon Union (ITU) World Cup Series and the 1997 Triathlon World Championships. The Maple Grove Triathlon built an inviting triathlon platform in its first edition in 2010 with 500 participants. Co-founded by Lindsey Kurhajetz and Jeanette Neumann, the Maple Grove Triathlon has received a warm welcome by their hometown. 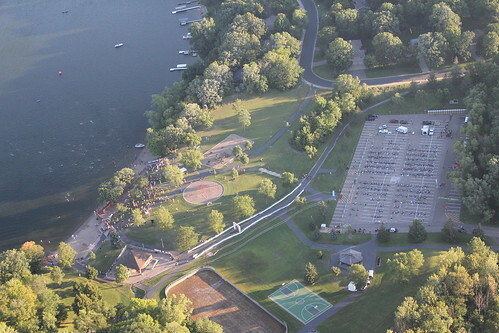 Maple Grove is spacious venue centrally located in the northwest metro of Minnesota, and home to the Triathlon venue, Weaver Lake Park, boasting 80-acres of event space ideal for visiting competitors, spectators, and race sponsors. The TriStar111 is new and exciting format being introduced not only to this Triathlon, but to the United States. Minnesota is a nationally recognized epicenter for cycling that continues to win awards and accolades for its progressive cycling community, so the addition of the TriStar will be a perfect fit. Embarking on their second year, the Maple Grove Triathlon asks its athletes to Dare to TRI. It welcomes elite and avid triathletes, amateurs, and those considering joining the fastest growing sport in the United States. “Over 1000 elite, avid and amateur triathletes are expected to make the 2011 event roster and compete in the event’s Sprint, Olympic and the brand new TriStar111 distance. We’re pleased and honored to be part of the first TriStar event in the US”, says Lindsey Kurhajetz, Race Director at Dare to Dream Events, Star Production’s partner for the TriStar111 Minnesota event. Here at TriStar111 Minnesota 2011! In the next two days, TriStarLive.com will be covering the TriStar111 in Maple Grove, Minnesota, USA on 26/27 August 2011. In addition you’ll find coverage of the Maple Grove Olympic and Sprint Triathlons. We’re looking forward to welcoming you back with rankings, times, results, live updates, videos, photos… and more. In addition, Best Buy Mobile, a proud sponsor of the Maple Grove Triathlon, will be providing live video feed from the race. Coming up: TriStar111 Minnesota 2011 Live Coverage this weekend! There at TriStar111 Minnesota! The next live Event covered on TriStarLive.com will be TriStar111 Minnesota on 26/27 August 2011. Best Buy Mobile is proud to present LIVE video streaming and GPS pro-athlete tracking during the Maple Grove Triathlon and TriStar111 Minnesota events this Saturday, August 27, 2011. Best Buy will be on-site race day with live video and GPS feeds of the race showcased on four large screens in the Best Buy tents for convenient viewing by friends, family and athletes. On Friday, stop by the Best Buy Mobile tents during registration to see if your phone is ready for an upgrade and to register for some GREAT prizes. Saturday, remind your biggest fans to stop by the Best Buy Mobile tents to watch for you on the live video feeds or watch the PROs battle it out with live GPS tracking. Friends and family can also install video tracking applications, enter to win prizes and see if they’re eligible for a new phone upgrade. Best Buy will also be on site providing a mobile charging station for cell phones and a wifi mobile hotspot to connect mobile devices at the event.